That’s the beauty of a place like Mountain Light Sanctuary: the experience is what you make it, and you can find your own niche on the camping-to-glamping continuum. 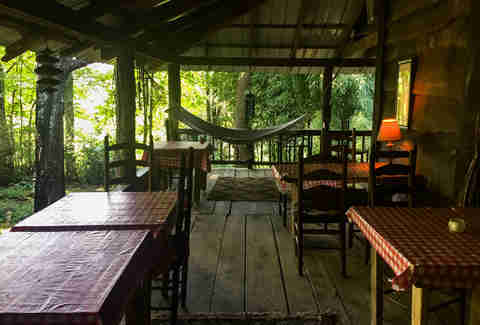 Located about 35 miles north of Asheville, North Carolina, the property consists of 18 rustic shelters across 7 acres. Some -- like mine, Balihouse -- cater to the camper who prefers to be near an electrical outlet. Then there’s MerlinWood, which is literally just a canopied bed in the middle of the forest. There are no doors, no locks -- and no fees. Across the country, retreats like Mountain Light uphold an old-school tradition (like, thousands-of-years-old-school) of welcoming refuge-seekers and travelers for a donation-based stay. While they suggest basic rates, you might even exchange shelter for work around the grounds. 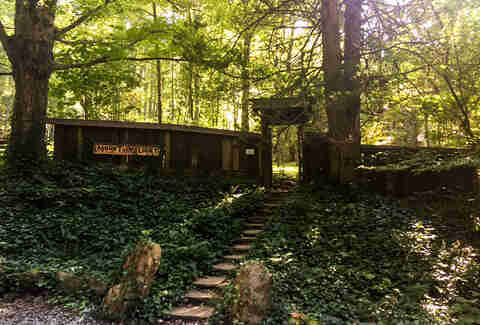 You pay what you feel the experience is worth, which, at Mountain Light, may end up being quite a lot; according to the owner, there are fairies and interdimensional beings to be found here. 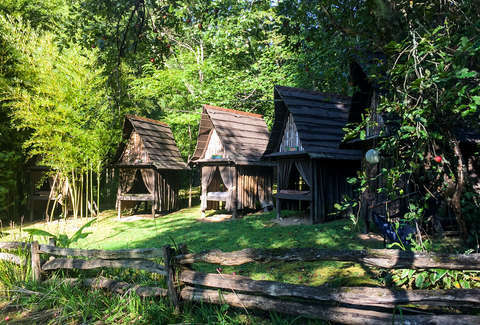 Like many of the world's most unreal-yet-affordable places to stay, Mountain Light has a hippie spiritual vibe that’s ultimately pretty dang endearing. When you reserve a shelter online, they don’t ask for a credit card number. When you arrive, you get a warm welcome and a tour of the property -- no ID check, no deposit. “I really want people to walk through the gates and feel a shift in energy,” the owner, Michael Lightweaver, tells me. “We try to model a gentle and generous way of being.” Before you leave, you simply leave your gift (cash or check) inside an envelope under the gnome on the front table. Yes, gnome. Quite a few of ‘em are scattered about the premises. Even if you aren’t looking to monkishly surrender your phone, sanctuaries can offer a respite from “the real world.” The thing is: Lightweaver believes that Mountain Light hosts interdimensional beings. He tells me that visitors discover colorful balls of light that appear in the pictures they take here, whether on film or digital. He calls these “orbs,” intelligent beings that are invisible to the naked eye. Apparently guests have seen also spotted UFOs and fairies. This certainly raised my eyebrow. I’m more skilled at skepticism than camping, and here I was about to hang out in a secluded forest with no locks on my non-existent door, amid a bunch of orbs, or at least people who believe in them. But those misgivings vanished when I met Lightweaver. He’s nice. Really nice. So nice that my earlier concerns made me feel like a jerk. He has a master’s degree in behavioral science and began his career in Nashville as a hypnotherapist. But the North Carolina mountains called him, and he bought and renovated a dilapidated home in 1995. When friends started coming for extended stays, he added more and more shelters, until it officially became Mountain Light Sanctuary in 2000. Of the guests I meet, none have come for the orbs, or for any other overtly spiritual purpose. Their desires are of a simpler nature: to get away. I’m one. I’m here with my husband, Jimmy, desperate to unplug after a grueling work week. When my cell signal dies en route, I celebrate. For the duration of our visit, my phone’s only use is as a flashlight and camera. I don’t know what Trump’s tweeted; I don’t know what coworkers have requested; I don’t know what fresh hell awaits me in the news. I’m shocked by how little I care about any of it once I flip to airplane mode and breathe in the mountain air. The folks who’ve made their way to Mountain Light are mostly here to enjoy the outdoors. In the shelter next to ours is Rick Alvarez, a risk analyst from Tampa. He just turned 40, and in defiance of his birthday, he ran a half marathon and came out here to hike for five days. He’s staying in Frodo’s, a small shelter similar to ours with three stone walls, a sod roof, a stone fireplace, and an open view of the river. He’s not much of a camper, but the shelters here looked so cool that it seemed an irresistible dare. “Until now, my definition of roughing it meant skipping a pedicure,” he says. Like Rick, Jimmy and I are keen on taking advantage of the hiking trails that connect the sanctuary and Pisgah. One steep, rocky 40-minute trek leads us to a small waterfall. We dip our feet into the pool at the fall’s base and take it easy before confronting the critical question of how to spend the rest of our day: do we read in the garden, or nap in a hammock? Do we browse the library, or do yoga in the outdoor pavilion? I realize that we’re barely speaking. We’ve achieved a level of relaxation that has transcended language. Lightweaver stays active around the property, greeting guests and making himself available to talk orbs, if they’re interested. He dresses in loose, simple clothing and walks in bare feet as he tends the grounds, on which he’s created various shared spaces of ambiguous spiritual significance. 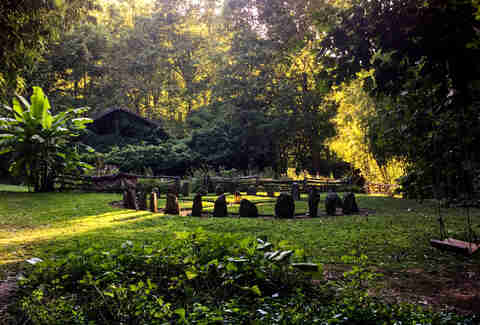 In fact, Lightweaver welcomes guests to bring their own interpretations to his creations: for example, a stone circle in the center of the property could be a Native American medicine wheel or a Celtic stone circle. Nearby is a garden of wildflowers with 12 benches that surround a crystal obelisk. Some use it as a place to meditate; some use it as a place of ritual. I use it as a place to try to count an uncountable number of butterflies. Jimmy and I turn in early, 9pm. It’s cold and supremely dark, and there seems no better place to be than here in the mountains, under a big blanket listening to the river run. It’s easy to dismiss the orbs and fairies (sadly, I saw none), but it’s harder to deny the inherent magic of this place. Underneath the gnome the next morning is an envelope with my gift and a note of gratitude. I’m rested, peaceful. I keep my phone off even after I drive back into range. Getting away from the world for a couple days has made me return a bigger fan of it. Which, these days, seems like magic enough. Jen McGivney is a writer in Charlotte, North Carolina, who's slowly working her way up the glamping-to-camping continuum. Follow her on Twitter at @jen_mcgivney.